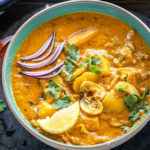 Kadai in Hindi literally means “a thick, circular, and deep wok” widely used in Indian cooking so the word “kadai” in Indian recipes is used when a dish is cooked in kadai and it almost always involves bell peppers. You can see I used a mini kadai in the 1st pic, the ones in which we cook are obviously larger than this! So the story goes like this, ever since I can remember I have always loved mushroom. Even though growing up, it was not a veggie that mom would make often still whenever she made it, I ate 1 big bowl full. I love mushroom in my pizzas, burgers and just about everything. And then I got married. And then I realized that my husband hates it and that was the end of my love affair with mushroom. No he never asked me to not cook it but it seemed like a lot of work to cook something exclusively for myself. But last week hubby forced me to buy some mushroom and he promised that he would give it a try and so finally after 3 years of marriage I made mushrooms! 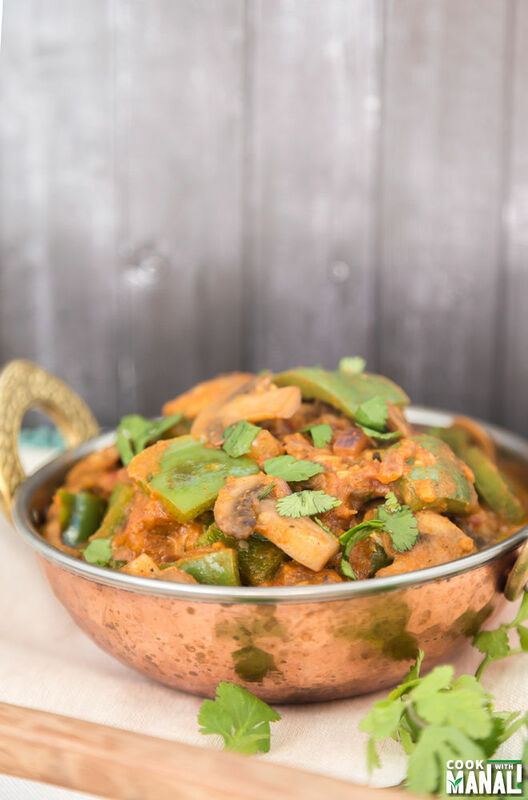 As soon as I got the packet from Whole Foods, I knew I was going to make Kadai Mushroom simply because anything with green bell pepper in it is my instant favorite and I’m so glad I made it. The dish turned out delicious, hubby gave it a try and actually liked it! Whattttttttttt! I am still in shock, he said this is actually good! So yeah get ready for more mushroom recipes on my blog very soon! Is this vegan? No because I added 1 tablespoon of cream to it. Just skip that and then it’s all vegan! 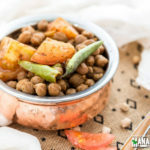 Give this flavorful dish a try, it’s the perfect side dish for naan, paratha or roti. I ate it with some vegetable biryani and loved it! A tip to make this dish more flavorful, use fresh ginger garlic paste rather than store bought. It makes a lot of difference. To make fresh ginger garlic paste simply chop garlic and ginger very finely and then crush the two together using your mortar and pestle. It’s a little extra work but it’s so worth it. Heat 1/2 teaspoon of oil in a pan on medium heat. Once hot, add cubed green bell pepper and saute for 1-2 minutes or till the sides start to get very light brown. Set aside. In the same pan, heat 1 teaspoon of oil and add sliced white mushrooms. Saute till mushrooms turns golden brown in color. This will take few minutes as mushrooms first release a lot of moisture and then start getting brown. Set aside. In a pan dry roast coriander seeds and whole dry red chili for 2-3 minutes or till you get a nice aroma. Transfer roasted spices to a spice grinder and grind to a fine powder. Set aside. In a pan, heat 2 teaspoons of oil on medium heat. Once oil is hot, add chopped red onions. Add tomato puree and cook for 5-6 minutes on medium heat. Then add the roasted spice powder and cook 1-2 minutes. If it looks like the spices can burn, add little water. Add 1/2 cup water, kashmiri red chili powder, sugar, vinegar and salt and let it all come to a boil. Finally add in the sauteed bell pepper (capsicum) and mushrooms and mix. Add crushed kasuri methi & mix. 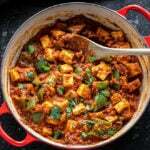 Sprinkle garam masala on top, garnish with chopped cilantro and serve kadai mushroom hot with naan or roti. * Adjust the quantity of water according to how thin or thick you want your gravy to be. Add 1/2 cup water at first and then add more if required. If you want it to be absolutely dry, do not add any water, mine was semi-dry. 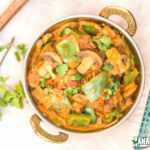 * For spicier Kadai Mushroom, add 1-2 extra whole dried red chilies. * Skip cream to make it vegan and follow rest of the steps as it is. 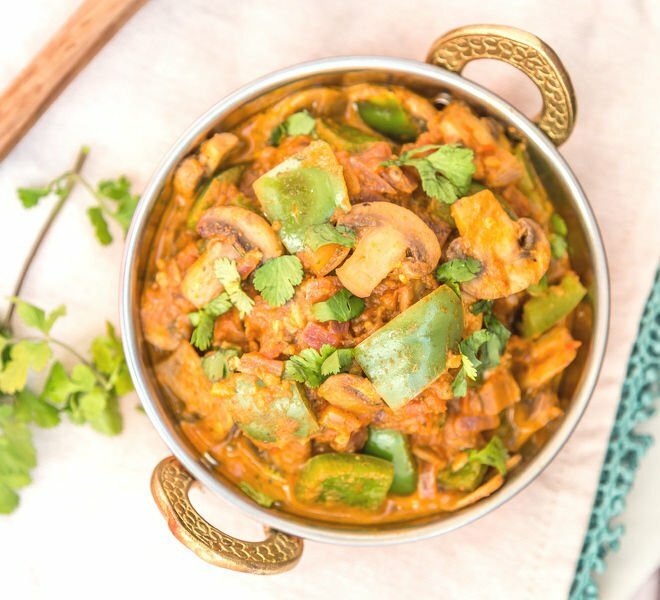 Kadai Mushroom is a flavorful Indian dish where Mushroom & Bell Pepper are cooked in a spicy onion tomato curry. Heat 1/2 teaspoon of oil in a pan on medium heat. Once hot, add cubed bell pepper and saute for 1-2 minutes or till the sides start to get very light brown. Set aside. Then add the roasted spice powder and cook 1-2 minutes. If you the spices can burn, add little water. Add water, kashmiri red chili powder, sugar, vinegar and salt and let it all come to a boil. Add cream and mix and finally add in the sauteed bell pepper (capsicum) and mushrooms and mix. Add crushed kasuri methi & mix. Manali! I need this wok! lol It’s gorgeous!!! I absolutely love mushrooms! I could eat them all day, every day and try to sneak them into my cooking whenever I can. And I love finding new ways to prepare them! 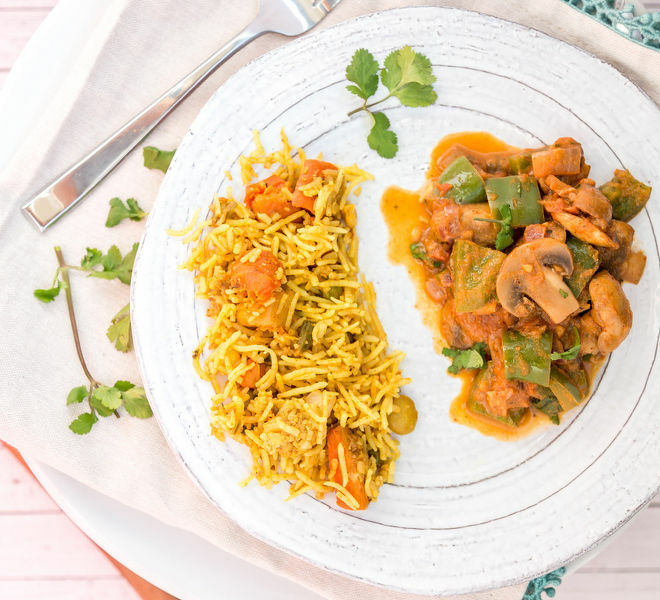 This dish looks so flavorful, Manali! Love it! Yummy!! We both love mushroom dishes and yet I am not successful at creating a good Indian mushroom dish!! So trying this soon Manali!! I love love love mushrooms – one of my favourite things ever. Luckily everyone else in my house likes them too so I get to have them all the time! This looks delicious Manali! Lucky you Stacey but now I might make them more often too! yay! 🙂 and thank you! Oh yeah, mushroom matar is one of my other favorite! I used to love mushrooms as a kid too! I love that you used them in this dish, it sounds so perfect. So beautiful too! Manali, you know what, I too have cooked mushrooms today 🙂 Your kadai mushroom looks delicious! Have to try this version soon! pinning! Same pinch Savita!! 🙂 n Thanks dear! 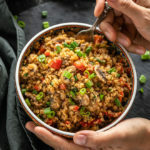 My husband is the opposite and absolutely loves mushrooms so he would love if I made this for him! It looks so flavorful and delicious! Thanks Kelly, I am sure he will like it!